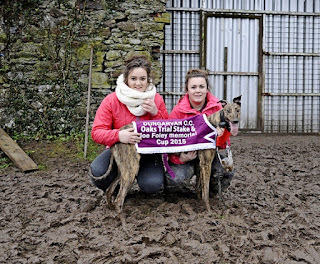 First muzzled open coursing report and photos. 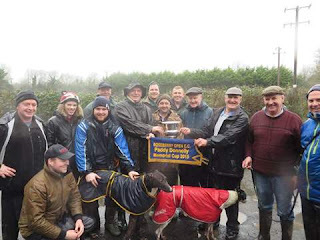 ROSEBERRY OPEN COURSING ST STEPHENS DAY 2015. Following the recent rainy spell open coursing enthusiasts gathered in Roseberry on St Stephens morning well kitted out for the day that lay ahead. 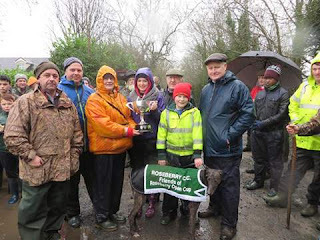 Due to a plentiful supply of stock all were on the way home by 12.15 hrs after what was one of the best days hunting that this club has produced in recent years. The feature event the Paddy Donnelly Memorial Cup sponsored by Paddy's great friend Eric Thorpe ended up with a divide between Sean McDonalds White Toast and Denis O'Callaghan's Brosna Ranger. Both these tired dogs were slipped behind a stag of a hare in the final but went unsighted, before their handlers could catch them they latched on to a fresh hare that gave them both a right dusting in the far end of Farrell's field. Judge Eugene Doyle correctly took off the cap to signal an undecided . Both owners then sportingly called a divide. In the opening course that were sent on their way by Slipper John Doogue at 10.35 White Toast just led Lobnamna Boo by a tight length with a slight touch of favour. Driving in for the first the Toast ended up on her side allowing Lobnamna in for two quick scores. Once regaining her composure White Toast jealously took possession of the hare and after 34s puss made cover heading towards the Higgins household. In a very tight buckle little separated Renville Cross and Watch Out Sands on the run up. Showing slightly more determination Renville drove the opening points by half a length. As this stag of a hare made for the bottom of the field Renville began to outscore her rival and on 35s she had enough done once puss slipped out towards Morrissey's yard.